I believe that 2008 had the perfect growing season that suited this grape variety the best. 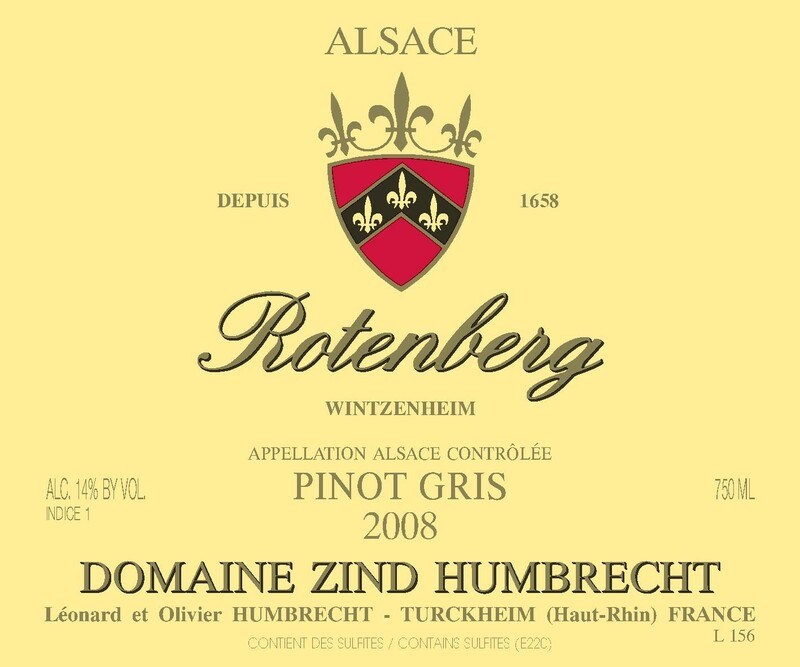 Very often in big vintages (very warm, precocious years), Pinot Gris can often ripen too quickly and develop botrytis at such a speed that we are almost obliged to produce late harvest style wines, especially in the Rotenberg which enjoys perfect late ripening conditions. In 2008, the noble rot was there, but it appeared gently, slowly and late, when the grapes were fully ripe. This gave the time to do selections. Not the usual ones, because in 2008 we did ‘positive’ selections: we first harvested the healthy clusters in order to make drier type wines, and left the cluster with botrytis for later harvest. So this wine is made from one of these healthy cluster selections. The aim was to obtain good ripeness, without all the elements that would push this wine into high sweetness, like the Pinot Gris Vieilles Vignes for example. The fermentation was slow (12 months) but very consistent. 3/2010: I am always apprehensive of a drier style Pinot Gris as they can be quite austere in their youth. This isn’t the case here. The nose shows beautiful ripe fruit, but without noble rot, there is also a strong mineral feel. The wine is not giving everything today which adds complexity. The palate tastes quite dry, but not lean. There are richness and length, with a clean salivating finish due to the beautiful acidity. It is actually quite rare to be able to produce this style of Pinot Gris.